I am a cultural historian of nineteenth-century American technology. My work on nineteenth and early-twentieth century American luxury hotels seeks to explain the way in which capitalists and civic leaders used representations of technology to reconcile an agenda of luxury development with emerging ideas about egalitarian democracy and progress. My book, Hotel Dreams: Technology, Luxury, and Urban Ambition in America, 1829-1929, was published in March 2011 by Johns Hopkins University Press. (Also on Amazon.) Hotel Dreams was awarded the 2012 Sally Hacker Prize by the Society for the History of Technology for the best book written in the history of technology directed to a broad audience of readers, including students and the interested public. 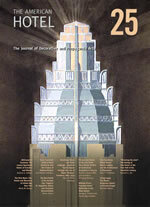 I served as guest editor for The Journal of Decorative and Propaganda Arts, Volume 25. This hotel theme issue is the first scholarly collection of essays devoted to the study of American hotels.JDAPA is the journal of the Wolfsonian Museum in Miami Beach, Florida, affiliated with Florida International University. The journal is distributed by MIT Press and has won several design awards. In addition to the history of technology, my research interests include material culture, architectural, social, and gender history. I also serve as associate dean in the College and Arts and Sciences.